On the endless cable TV lines that criss-cross the skies connecting buildings of Mumbai, you see many a 'school' of crows and other birds resting their tired wings. A crow used to daily sit on one such 'wire of technology' every evening. In the kite flying season, a kite got entangled there and got separated from its rightful owner. 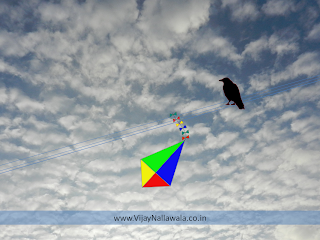 Well, with the kite stuck to that spot, it did not take long for the crow to start an unusual friendship with it. The kite had lost none of its arrogance and boastfulness despite being imprisoned forever. "You crows are such ugly, black creatures. There is so little to admire in you. Look at me! Endowed with all the colours I'd want and coveted by so many. All the street boys run after me so that one of them can be the first to claim his prize catch! Wonder if you attract even a second glance from anyone? You have to fly all day, flapping your wings..even the wind is my friend: I'm flown by someone who is in love with me and does not want to let me go." The crow listened to the nagging of his friend virtually everyday without answering back. Then one evening, the crow, of a sudden, appeared alarmed and flew off without warning. He had heard the cries of other birds signalling the impending storm. It was a wild, raging storm- although it lasted for a brief while, it's ferocity was vicious, as was the havoc that it wreaked. The next evening was again a clear one. The crow came back to its favourite place. It was saddened by what it saw. His friend was in tatters and all that remained was the frame which was still hanging on limply. The daily taunts he had to bear from his friend were quickly forgotten. The crow felt its absence. Tale Two: The Friends meet again..
Last week there was an uncanny repetition of an earlier occurrence I had written about. I heard the relentless cawing of crows in the garden, which is part of our housing complex. On checking this mid morning commotion below, I saw them circling around and above a cluster of trees. Recalling the last incident. was sure that this was to draw attention to some bird in distress. It was easy to spot the wildly flapping crow: it appeared to be entangled in a kite string. Of course, there was this plastic silver Kite stuck a few feet above it , stuck there since a long time. As I could not bear the plight of the crow, I thought about what could be done to free it. It was stuck at too great a height to be reached with the help of a ladder. I tried calling the fire station, located just a mile away (their men do assist in such cases). Couldn't get through to their number despite repeated attempts. Meanwhile the cacophony of the crows died down. The poor crow made a few more feeble attempts to break loose, in vain. Later in the evening I was distressed to see the poor bird, totally limp by then as it had got strangulated. During its struggle, the Kite string had got wound around its neck and it oddly hung in a vertical position with it's beak facing upwards. Wonder what the Kite must have been thinking?